How can anyone make sense out of so many competing objectives? How should we make intelligent trade-offs between objectives? Curiously, if any of these three is removed, the others can never be achieved. A business might make hefty profits in the short-term, but no one will work there very long if employees are dissatisfied. What will happen to profits then? And if the customers are unhappy, they will find alternatives as well. How long can profits continue to grow and employees continue to be satisfied without any customers? Curiously, if you define the system goal as any of the above three necessary conditions, the remaining two are automatically required as essential input! “Wealth, like happiness, is never attained when sought after directly. What, then, is The Goal? The Theory of Constraints defines every system in terms of it's Goal. Without a Goal there can be no constraint! Not all three necessary conditions are equally measurable. Gauging Employee Satisfaction is not nearly as straightforward as just taking a survey. And customers, no matter how satisfied, always crave for more. Profits, on the other hand, are easily quantifiable in currency units and lend themselves to comparison vs. prior periods. So, for convenience sake, TOC frames the Goal of a publicly traded companies in terms of making more and more money. Varies: truth, beauty, mastery, worship, helping others, etc. 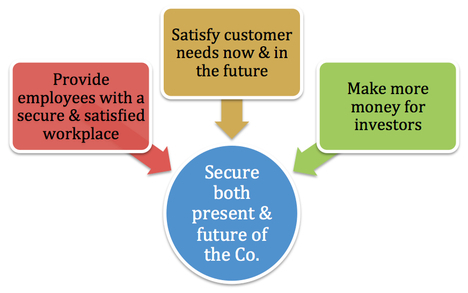 Secure & satisfied employees, customers, suppliers, investors, lenders, etc.